Thematic song recitals pop up every now and then. Recently I had Laura Claycomb’s and Mark Teicholz’s Open Your Heart and now along comes Monologe. A lot of the songs here are well-known but nothing is overexposed and together they give a wide picture of being alone: loneliness, sorrow, resignation, but also acceptance and even satisfaction (The Monk and the Cat). With Schubert framing as well as having his own group of songs we get a coherent structure, which is further enhanced through two German composers placed in the middle of the programme, flanked by two French groups. They, for their part, are flanked by English groups. Schubert is represented by some of his most gripping songs, in particular the three Goethe settings Gesänge des Harfners in deeply satisfying readings, soft, inward and touching. Hermann Reutter’s compositions are rarely heard today. Yet he was prolific in several genres, wrote nine operas and three ballets, orchestral and instrumental music and more than 200 lieder. Dietrich Fischer-Dieskau recorded some of these with the composer at the piano, and as accompanist Reutter worked with Schwarzkopf, Hotter and Gedda. The three monologues of Empedocles are drawn from Hölderlin’s verse drama The Death of Empedocles and set to music in 1960. Empedocles was a Greek philosopher who lived between c. 490 BC and c. 430 BC in Sicily. He is the founder of the four-element theory (everything is composed of the four original elements: fire, air, water and earth), and describes the cosmos cycle as a constant battle between the two forces of Nature: love and hate. Hölderlin’s drama depicts Empedocles as living in harmony with Nature and tries to convince the humans to change the direction of their lives. When this fails he commits suicide by throwing himself into the crater of Etna. This is a very brief recapitulation of Florian Just’s comprehensive liner-notes. To this can be added that Reutter obviously was deeply fascinated by Empedocles, since he also wrote an opera about him, Der Tod des Empedokles (1954), presumably based on Hölderlin. 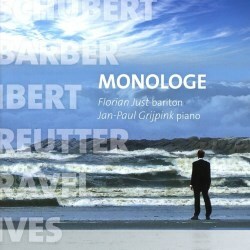 The monologues are fascinating with a truly expressive piano part. This is music to return to for deeper appreciation and it is laudable that the record company contributes to a widening of the repertoire. Ibert’s and Ravel’s song-cycles are both connected with the 1933 film based on Cervantes’ novel Don Quixote. The title role was played by the great Russian bass Feodor Chaliapin, who 23 years earlier had premiered Massenet’s opera on the same story. The producers of the film wanted some songs for Chaliapin and commissioned Ravel to compose them, but since he was unable to meet the deadline, they turned to Ibert, who at short notice saved the situation. Thus the liner notes describe the situation. Wikipedia has another version. According to them five composers were separately approached to write the songs for Chaliapin, besides Ravel and Ibert, Marcel Delannoy, Manuel de Falla and Darius Milhaud were asked, each of them believing that he alone was commissioned. Ibert’s music was chosen, which turned out to be a problem, since he and Ravel were close friends and Ravel contemplated a lawsuit against the producers. In the end he dropped the action and the two remained friends. Whichever version is correct the outcome was two valuable additions to the song repertoire. It is fascinating to compare them, whether in orchestrated version or with piano. Both composers have convincingly caught the Spanish atmosphere, Ibert even more atmospheric in the colourful orchestral version. Chanson de la Mort de Don Quichotte is utterly touching. Ravel on the other hand is most impressive in the vital drinking song with a true flamenco touch and the piano depicting the sparkling wine. Florian Just’s readings are eminently satisfying in every respect. I do however recommend interested readers to search out a good recording of the orchestral versions, and there José Van Dam is a safe bet. Also don’t forget Chaliapin’s recording from the soundtrack of the film. The mid-1930s sound is no match for the modern versions but Chaliapin’s singing is unique in its involvement and intensity. He was sixty at the time but still an impressive singing-actor. Of the two contrasting English-language groups of songs, Samuel Barber’s are interesting insofar as they are based on medieval texts by Irish monks. These texts reveal that times certainly have changed but that people have always dealt with the same timeless questions. It is a pity that space obviously couldn’t be found to include all ten songs. The way Florian Just sings them whets one’s appetite to hear him in the complete cycle. The songs were written in 1953 and premiered by Leontyne Price with the composer at the piano. They also recorded them for American Columbia. Another attractive recording is available with Cheryl Studer on the 2 CD-set with Barber’s complete songs, recorded in the 1990s by Deutsche Grammophon. Charles Ives’ songs are always fascinating, sometimes weird, sometimes just fun. These three settings of Browning, Rossetti and Whitman are deeply serious and should be heard more often. The whole recital is a sprawling but at the same time homogenous concept that can be experienced both as a remarkable unit as well as something to dip into for individual songs. Florian Just is definitely a singer to do full justice to this varied repertoire. He has a powerful, flexible voice and he is a master of nuance. He is perceptive and sensitive to the lyrics – in other words an ideal song interpreter. Jan-Paul Grijpink accompanies excellently. The well-written liner-notes are very helpful for a full appreciation of the songs and the recording is good. At first I reacted against the short pauses between the songs. Generally one wants more space to contemplate what one has just heard and prepare for the next. I suppose the artists - or the producer – want to underline the affinity between cultures and times. To sum things up: a thematic recital out of the ordinary and worth anyone’s attention.